Here is one of my latest projects. The scope of work was to create a detailed facade drawing of the front of a low-rise building that is located in Brooklyn, NY. Below is a picture of the building, a video that I shot on site, and the completed drawing. My client needed me to document the exterior elevation in AutoCAD format so that he could begin the restoration of it. He’ll first use the drawing to submit to NYC Landmarks Preservation Commission for their review and approval of the proposed restoration work. Then he’ll use the drawing to submit to contractors for their bidding on doing the restoration work. Here’s a picture of the facade. 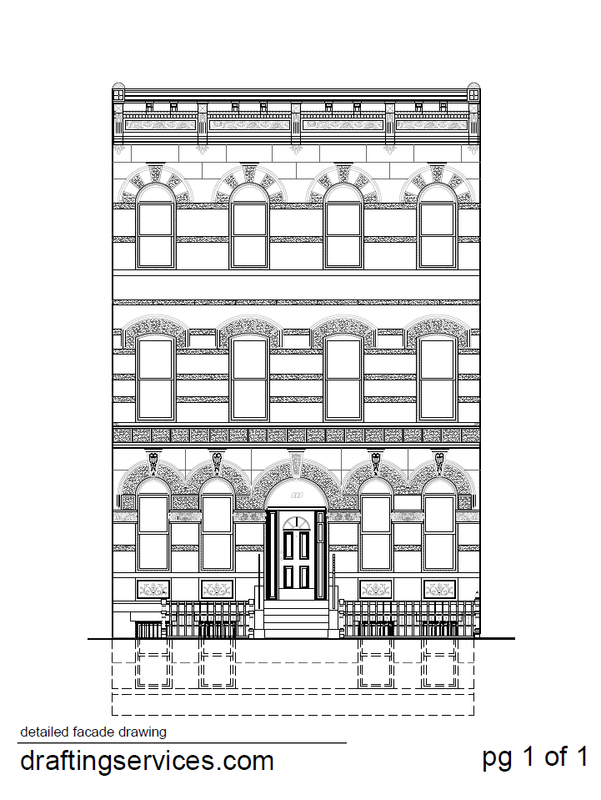 Here’s an image of the detailed facade drawing. Click the image to view the drawing in PDF format. Hope you enjoyed this brief project summary, and the related images. Please subscribe to my blog, if you’d like to see more posts like this.